Oxum—A Rainha das águas doces (Oxum—The Queen of Fresh Waters) from the series Orixás, 2016. Digitally enhanced photograph. 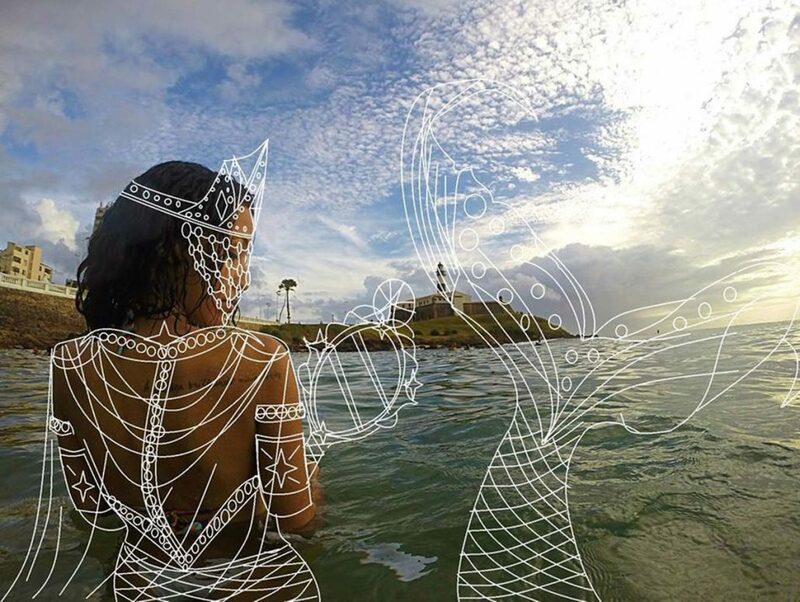 Drawing by Tauan Carmo, Photograph by Tiago Troccoli. “Axé Bahia: The Power of Art in an Afro-Brazilian Metropolis” explores the distinctive cultural identity of the city of Salvador, the coastal capital of the Brazilian state of Bahia and a sister city of Los Angeles. Founded in 1549, Salvador is Brazil’s third-largest metropolis with a population of more than 3 million, the majority of whom have African ancestry. This exhibition — the most comprehensive presentation of Afro-Brazilian art ever presented in the United States — examines how artistic practices express and shape crucial aspects of identity and experience in Bahia and beyond. “Axé Bahia” runs from Sept. 24 through April 15, 2018 at the Fowler Museum at UCLA and is part of the Getty initiative Pacific Standard Time: LA/LA — a far-reaching and ambitious exploration of Latin American and Latino art in dialogue with Los Angeles. Dating primarily from the mid-20th to the early 21st century and including sculpture, painting, photography, video, and installation art, these works illustrate the ways in which seminal artists (Brazilians and resident foreigners alike) have expanded the visual richness of Bahian culture. They also demonstrate potent, and often provocative, responses to the legacy of slavery and ongoing forms of inequality. In Salvador, the Yoruba-derived word axé (pronounced “ah-sheh”) is frequently encountered and serves as a Bahian catchword, ranging in meanings from “blessings,” or “peace,” to “let it be so!” or “right on!” As understood in the theology of the Afro-Brazilian religion Candomblé, axé is the intangible energy or vital force that infuses life and carries the potential for positive change in the world—a power that manifests most visibly in ritual and art. 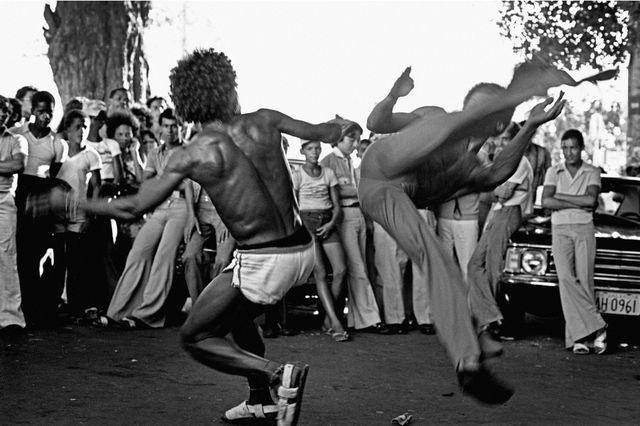 Dança da Capoeira II (The Dance of Capoeira II), 1976. “Axé Bahia: The Power of Art in an Afro-Brazilian Metropolis” will be accompanied by a fully illustrated publication. This volume includes essays by the four curators and contributions by 14 scholars including Scott Alves Barton, Sarah Chenault, Kimberly Cleveland, Christopher Dunn, Cécile Fromont, Ana Paula Höfling, Vanda Machado, Lucas Marques, J. Lorand Matory, Paulo Miguez, Anadelia Romo, Roger Sansi, Heather Shirey and Jeri Bernadette Williams. “Axé Bahia” is organized by the Fowler Museum at UCLA. The curatorial team is led by Patrick Polk, the Fowler’s curator of Latin American and Caribbean popular arts, along with guest co-curators Roberto Conduru (independent curator and associate professor of art history and Theory at the Art Institute, Rio de Janeiro State University); Sabrina Gledhill (Brazil-based scholar of Bahian culture and history); and Randal Johnson (distinguished professor of Spanish and Portuguese at UCLA). Presented as part of Pacific Standard Time: LA/LA, this exhibition anchors the Fowler’s three-part program exploring Brazil’s African history and cultural heritage, which includes “Lineage through Landscape: Tracing Egun in Brazil by Fran Siegel” (through Dec. 10) and “Africa/Americas: Photographic Portraits by Pierre Verger” (Sept. 10 through Jan. 21, 2018). Major support is provided by grants from the Getty Foundation. Latino art in dialogue with Los Angeles taking place from September 2017 through January 2018. Led by the Getty, Pacific Standard Time: LA/LA is a collaboration of arts institutions across Southern California. Through a series of thematically linked exhibitions and programs, Pacific Standard Time: LA/LA highlights different aspects of Latin American and Latino art from the ancient world to the present day. With topics such as luxury arts in the pre-Columbian Americas, 20th century Afro-Brazilian art, alternative spaces in Mexico City, and boundary-crossing practices of Latino artists, exhibitions range from monographic studies of individual artists to broad surveys that cut across numerous countries. The Fowler Museum at UCLA explores global arts and cultures with an emphasis on works from Africa, Asia, the Pacific and the Americas — past and present. The Fowler enhances understanding of world cultures through dynamic exhibitions, publications, and public programs, informed by interdisciplinary approaches and the perspectives of the cultures represented. Also featured is the work of international contemporary artists presented within the complex frameworks of politics, culture and social action. Admission to the Fowler is free. Hours: Wednesday 12–8 p.m. and Thursday through Sunday 12–5 p.m. Parking available in UCLA Lot 4, 221 Westwood Plaza at Sunset Boulevard. $3/hr (maximum $12/day).